I enjoyed Unshelved, a comic about a public library and its librarians, but, sometimes the cartoon hit too close to home. I've been treated and spoken to like Dewey at the information desk, tons of times. So, librarians beware. Some of these are almost too true to be funny. On the other hand, I like my job, so I've never responded like Dewey. It's cathartic, reading his sarcastic responses to ridiculous questions and situations.Favorite character: Buddy the Book Beaver! Of course.Favorite cartoons: The one where Merv writes a brochure to get more teens to come to the library pg 33 (my department is responsible for the young adult room, so I really appreciated the humor).When the patron asks Dewey if he has any pens when he's standing next to a pile of pens (happens all the time). bottom of pg 41And finally, when Dewey starts dispensing Eastern philosophy to the library patrons: "Search without searching. Look for nothing and find everything. Read the book but don't look at the words." top of pg 103. That's probably me in about thirty years.If you enjoyed Unshelved, you may want to pick up Rex Libris, Volume I: I, Librarian (Rex Libris, #1-5) by James Turner (another librarian themed comic) or The Black Belt Librarian: Real-World Safety & Security by Warren Graham (non-fiction book on how to deal with difficult patrons or security risks at the library). Unshelved has been shamelessly recommended to me via Goodreads' recommendation page, based on a few other low key graphic novels that immediately resonated with me. It's almost like the filter won't let me move on until I read this one; I'm glad I finally took its advice. It just screams me! It's essentially Portlandia set in a library. Oh wait, wasn't that a skit? Never mind, that's the feminist bookstore. I'm doing the hand reach now...Dewey, the main protagonist, is the librarian who mans the reference desk, and is in charge of the young adult section. Armed with his fatalistic sarcasm, and antisocial shield, we sit back and watch him answer the most ridiculous questions, or in most cases skillfully avoid doing so. On hand are his trusty sidekick librarians, who aren't always the most helpful when it comes to dealing with many of the regulars (loony patrons). Styled in a daily comic format, the back leaf mentioned that many of the strips were based on actual experiences from Gene Ambaum's time working as a librarian. Others, as outlandish as they might seem, were based on experiences that were sent in by readers who are librarians. If you're a book nerd, love your local library, or just looking for a laugh, this book is definitely the book for you. I am so happy that there are more books in this series. I can't believe there isn't a television sitcom around that is set in a library. So much scope for the imagination. Why haven't I heard of this already? This sounds really good. And it was. Basically its comic strips that's set at a public library and its librarians. A lot of moments that will either make you smile or laugh or just well want to read the rest of the volumes. The art was fun too. Text: 4 starsArt: 3 starsSingle-author black-and-white compilation of comic strips, originally posted on the internet on a weekly basis. As with any comics collection, some of the strips are funnier than others. But overall, this is often humorous, especially if you're a librarian or hang out frequently in a library. I've been reading this free web comic for ages, and I was happy to support their KickStarter campaign of last year. My reward was a cute little thumb drive in the shape of an old fashioned library card catalog drawer, and on the thumb drive is a EPUB copy of all of the Unshelved books! My favorite comic in this book is Why are you letting my son look at adult websites? That one just cracks me up because it's so clever! I'm so happy I have so many more to read! A comic strip full of funny realistic stories about odd patrons and situations in a good sized library from the librarian side of the desk. 3.5 stars? While some of the jokes are starting to feel dated (ah, the days when we actually threw people out for eating and drinking in the library... or talking on their cell phones! ), Mr. Barnes' series catches the humorous insanity of life on the other side of the desk at the library and while it may be a little far-fetched (though not as much as you might think) there was plenty that rang true to my own experiences (though his main character is probably the least enthusiastic librarian I've ever met) and it was a fun/quick read that I'd definitely recommend it to anyone else who has ever worked in a library. There’s a smattering of amusing cartoons along with many mediocre ones. I do love the idea of cartoons about a library, librarians, and library patrons. I accidentally read the second book before I read this first one. Reading this first one, I did understand more about who a couple of the recurring characters are. I might have enjoyed these cartoons more one at a time or a few at a time.Instead of reading the book(s) you can read this cartoon daily, including via email or feed, which for me will be a much more enjoyable experience, at: http://www.unshelved.com/. I found this resource in the back of this book. 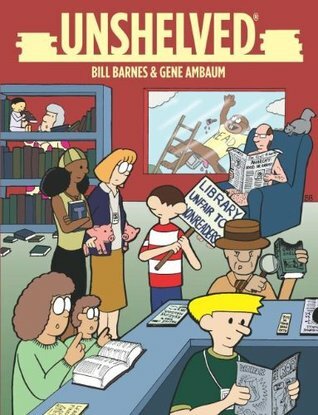 Bill Barnes and Gene Ambaum have created something special here: a comic strip about libraries and librarians. If you've ever worked at such a place, especially in recent years, you'll understand the crazy things Dewey, Tamara, and friends experience in this volume. Though the comic is viewable online, it's great to have a print edition of the strips. Some discerning readers may take issue with certain bits of humor, though. a collection of small comic strips all about library-ness. I liked it cause it shows the real side of much of it, such as the crazies and the stupids and the assholes we have to deal with day in and day out. It doesn't glorify working in a library like a lot of library related reading which I appreciated! Love this compilation of comics by the Unshelved guys - too funny and spot on! Many incidents reminded me of some things that have happened in my school library. I had the opportunity to hear Bill Barnes and Gene Ambaum speak at a conference and found them hilarious, love their comic strips and I look forward to reading many more! I should have started with this one, volume 1. Now I understand the guy in the beaver costume. I loved Dewey, Merv and the gang. Very funny. A few sections seemed to drag on for me, but it was still hilarious and I will likely read more of the series. The best cartoon ever, even if you don't work in a library. I thought it was great before I did (work in a public library), now I know: it's great and very true-to-life! This volume contains the earliest strips of the Unshelved comic. We get to meet the characters and learn about the origins of Buddy the Book Beaver. While the humor in the strip is accessible to everyone, Librarians will of course enjoy it the most.Or perhaps they won't enjoy the book as it cuts too close to home. The strip is not so much fiction as one would think. If you ever want to understand why special librarians are so much happier than public librarians, read Unshelved. Comic book taking place in the Mallville Public Library. Librarians, in particular, and others who enjoy libraries will enjoy reading these. There are 11 books in the series and the entire set can be purchased on a USB stick which is cleverly disguised as a card catalog drawer on the Unshelved website. They also sell blank card catalog drawer USB sticks. Hilarious throughout the book and a great cast of characters. I look forward to all the wacky shenanigans and obvious questions from patrons when I become a librarian. I liked this little wacky library. I think librarians themselves would find this much funnier than I did, but still enjoyable. I relate so much to Dewey. He does everything I wish I could. A lot of good laughs about life in a library. Some of it was a bit dated as it was written in 2004 but overall it was worth the read. Love! Stumbled across this book as I was shelving (I'm a page) and there are many LOL moments that rang true! This webcomic is really cute, if not much else. A friend lent me the first five volumes in hard copy, and I just finished one. Admittedly, I found it rather dull at first. Partway through it seems that Barnes and Ambaum start to get a feel for their own creation and the comic actually becomes funny. If you like somewhat twisted, sardonic humour – and/or if you have worked in / frequent a library – you'll probably enjoy Unshelved. (Here is a link to read it online.) Below, a quick summary of what I like and don't like about it:The good:- It's lighthearted. Any 'plots' that surface are quickly resolved, so the book is easy to flip through.- It's cathartic: Dewey (the young adult librarian) mouths off to idiotic patrons in ways we only wish we could.- In spite of the devilish, non-reading comic fan Merv, it portrays a healthy appreciation of comic books and graphic novels. (Surprise! )- The obvious: it's a comic about a library. Really, I'm not going to hide the fact I'm thrilled that such a thing has been written.The less good:- The art style is less than impressive. This ties in, I think, to the comic's intended seriality: understand that the authors originally meant for it to be published in the newspaper. It's too bad that didn't work out, because I think it really is best suited to the newspaper medium.- Don't expect a lot of rollicking humour here. Relatively few strips made me laugh out loud. Like I said, cute and not much else. You get the idea - it's not the best webcomic I've ever read, but it's certainly not the worst either. Do give it a try on your next rainy afternoon. If you can't get to a real library, at least. This is a library-themed comic strip that’s published as a webcomic as well as in this collection. (You can read it - and sign up for it - here.) It should appeal to those of us who work in libraries or bookstores, or who answer inane questions in some sort of information providing capacity. In other words, it rocks. The characters include Dewey, a reference librarian of the gen x variety who prefers reading comic books to answering reference questions (although he’s good at that, too), and his young adult minion Merve, who would rather play video games than read, but who idolizes Dewey. There’s the library manager who tries to live and work by the rules, but who is constantly faced with real life situations that blow her theories out of the water. On the patron side of things, there are a host of irritable and irritating regulars who will remind you of the people you see every day. There’s the naked lawyer guy who has a host of personal principles and is ready to sue the library over every infraction, the woman who repeats everything her child says in order to gang up on the person at the reference desk, and the guy who constantly breaks computer equipment. It’s hysterical and sometimes a bit exaggerated (except that you know there ARE people like this out there, and that’s a scary thought). Every library should have a copy, and every librarian should read it – for their own peace of mind. It's cathartic. "Do you have diet books for cats? ""No, ma'am, cats can't read. "I was initially bummed that the panels were in black & white, but it didn't seem to matter after a while. I laughed a few times reading this. I also felt the all too familiar "this has happened to me before" because the public library is a strange place. It's often NOT quiet and boring, contrary to popular belief. Strange requests and technology intolerance/impatience are common. And as a library worker, you must have the patience and tact of a saint. But if you're anything like Dewey or me, it's a struggle. Sometimes it is tempting to say something sassy or sarcastic but if you like/love your job (and want to keep it), you'll have to fight the urge.Although I enjoyed it, I felt a little bothered by Dewey's attitude towards his job. Yes, I know it's realistic because you can get cynical/jaded/sarcastic after a while, but it would have been nice to see him care a little bit more. The adventures of the Mallville Public Librarians and the patrons they serve. Okay, so if you've never worked in a library, you will probably get a few chuckles out of this. However, if you have worked in a library, this will be so true! And you may even be thankful you don't have some of these patrons. Content notes: No language issues. There is a patron who likes to wander the library naked, but there are always strategic items in the way; there is also a couple that is kissing in the stacks, but the librarians are up to the challenge. The only violence is a bookshelf that falls over, but no injuries (more likely to be disturbing is the germ warfare going on!). Bill Barnes Gene Ambaum - I'm the artist of Unshelved and write Not Invented Here. I mostly read sci-fi, history, biography, science, and mainstream comics. Whenever went wrong in the past and resulted in an alternate dystopian present, I'm a happy man. I have a small bookcase of favorite books that I re-read every year or two.